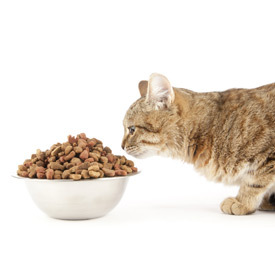 We stock the comprehensive range of dry and wet cat food which offers supreme nutrition for all cats. For specific problems for instance, we have food which is ideal for cats suffering from hairball problems. Hairballs are formed when hair swallowed by your cat during grooming accumulates in the stomach and can't pass on to the next part of the digestive system. Because your cat can't get rid of the hair in the normal way, he or she has to vomit it out. The James Wellbeloved formula contains 6% of natural insoluble pea fibre, which can trap swallowed hair and carry it all the way through the digestive tract and into the faeces, thus greatly reducing the incidence of vomited hairballs. We also stock food specifically for the housecat who doesn't venture outside which is lower in fat as house cats don't use as much energy. It also contains highly digestible ingredients to help keep their stools smaller and less smelly! Please call and see our selection and talk to our team to discuss which is the best food for your cat. 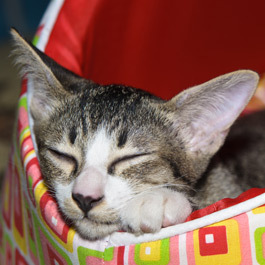 We offer a lovely selection of beds and bedding for your cat, including radiator beds, hooded igloo beds as well as soft mattresses, blankets and beds to ensure that your cat has somewhere comfortable to rest their head. Our cat care products range from medicines and treatments, to cat litter and disinfectants. 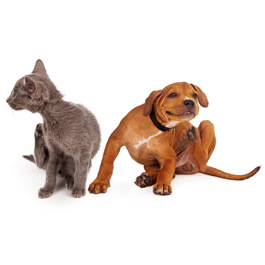 So whether you need, flea or worming cat supplies, dental aids or hairball remedies we're confident we have medicines and treatments to deal with most minor ailments. Come and talk to our team and discuss your cats needs. Our cat accessories include cat flaps, scratching posts, toys, collars, harnesses, bowls (available in stainless steel, plastic, melamine and ceramic), non slip mats for the bowls. We also stock Grooming Products, Pet Carriers and Crates, cat litter trays with a large choice in cat litter, from the basic to the woodchip and clumping variety. Cats love to play and scratching posts are a necessity if your furniture is to be spared! 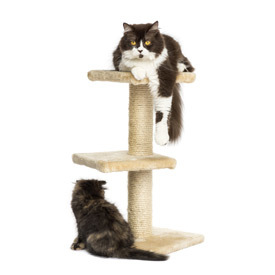 We stock a selection of cat posts, ranging from basic kitten scratch posts to much larger pieces of cat furniture, if we haven't got the one you want in stock, you can view our online instore catalogue and we can order it while you are there and it should be in the shop within a few days. There is also a large selection of toys, from mice to spiders, some of which can be filled with catnip which some cats go crazy for, as they are responding to the active ingredient in catnip called Nepetalactone. The reaction to this chemical is caused by the organ that operates a cat's five senses (touch, smell, sight, sound and taste.) those cats that do react will eat it or lick it; some roll in it and others just sniff it.